Another side-project from Naas Alcameth, mastermind behind Nightbringer and Akhlys, Aoratos is almost like a diet version of his main bands. Apparently it's "a reflection of the eidola and egregore arisen from the liminal thresholds", which sounds very esoteric and chin-strokingly dark, but it could equally mean "I got high and looked at the night sky" for all the difference this sort of occult language makes when translated into normal-speak. Without a doubt, however, as a fan of both other bands anything from Alcameth's pen is very much worth hearing, and Aoratos is no exception. As with his other projects, this is all about the interaction of dark atmospheres and black metal chaos, heaviness and ambience, and Gods Without Name is an effective and efficient dose of Alcamethian terror. An ominous ambient build-up in the form of intro Parallax Pt 1 heralds the darkness, Holy Mother of Terror following close behind with snarled vocals and further build before exploding into blackened rumbling about a minute in. Of Harvest, Scythe and Sickle Moon is more blunt and brutal yet without any lessening of the melody that writhes beneath the darkness, some disturbingly high-pitched screeches later in the track helping that nightmarish feel that is becoming a feature of Alcameth's style. There's an almost industrial feel to the clanging noises behind the metal on the title track, making those Blut Aus Nord comparisons even keener, and the way the track later on turns into a kind of blackened symphony is simply beautiful. This is all as grand and glorious as Akhlys' excellent The Dreaming I from 2015, and possibly better thanks to a tighter focus. And the Emperor-esque references made in my review of that come into bearing here too, thanks to the epic stormblast of Thresher with its synthesised choral backing and outrageously good guitar soloing in the eye of the tornado. Even the repeated shriek of "I am the thresher!" comes often enough to form something of a chorus, and almost tip the track over into catchy territory. As if that wasn't enough of an album highlight, the following The Watcher on the Threshold is even more harsh and brutal, a harrowing step sideways towards black/death territory with plenty of galloping drum battering and seethingly angry snarls. You could criticise the album for loading its centre with all the heaviest material, keeping more ambient fare like the eerie Prayer of Abjection for the front and end, but the tracks do all work well together having a similarly dark atmosphere whether heavy or light, and even if (like me) you do prefer the heavier moments the album as a whole flows terrifically well and rewards repeated listens. 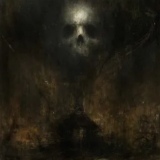 The sudden turn towards ambient funeral doom on Dread Spirit of the Place is another highlight, suggesting that Alcameth could make something very special by exploring this Elysian Blaze-y alternate path - that the track soon explodes back into a gushing black metal font suggests his heart is in the right place, however, and the sinister outro Parallax pt 2 is a fitting closing chapter for an album that more than demands repeated listens. If it wasn't for the imminent return of The Axis of Perdition and L'Acephale I'd hail this as the best atmospheric black metal of the year; we are blessed with dark bounties beyond our comprehension! Yet Aoratos is still very much a name deserving of praise from those who delight in black metal's most atmospheric ravings. Long may Naas Alcameth inflict his various projects on us undeserving few.